Samuel Johnson’s statement from the 18th century is just as true now as it was then. When exposed, scoundrels will often claim patriotic intentions while questioning the patriotism of their accusers. For example, in order to hide their true beliefs, anti-government conservatives decorate their homes, their cars and their persons with the stars and stripes of the American flag. To disguise their racism, white nationalists also hide behind the flag. In an attempt to hide the treasonous complicity of his presidential campaign with Russians, Donald J. Trump questioned Hillary Clinton’s patriotism by alleging that she sold 20 percent of US uranium to Russia. And at this year’s CPAC, the traitor-in-chief waddled onto stage and made a show out of embracing the flag. There are two distinct problems with that claim: One is that Trump doesn’t know the meaning of patriotism, and he doesn’t give a hoot about the majority of Americans. He has never tried to govern from the center in order to represent all Americans. He has done nothing to reach out to those who voted for his political opponents. Instead, he continually tries to pit his angry, loyal base against others – Democrats, people of color, Muslims and the LGBTQ population. He continues to call for investigations of Hillary by leading his followers in chants of “Lock her up.” He has refused to denounce neo-Nazis and white supremacists. In fact, he has embraced them. And he still maintains that President Obama was born in Kenya. Second, he is mischaracterizing social democracy by calling it socialism in order to equate Democratic proposals with those of the failed Soviet Union and Venezuela. But, in fact, the “socialist” policies being proposed by Democrats are similar to those of Britain, Canada, Denmark, Germany, Norway, Sweden and much of the developed world – policies such as universal health care, free or affordable education, the Green New Deal, higher marginal tax rates for the extremely wealthy, and higher rates for estate taxes. These are all necessary if we are to rebuild our infrastructure, our middle class and the American dream. Without such policies, we may soon find ourselves lagging behind other global powers. At the same time, in the name of patriotism, Trump and his administration have gone to extremes to destroy or diminish our nation’s most important institutions. If successful, his declaration of a national emergency to build his wall will diminish the power of purse given to the House of Representatives by our Constitution. He has damaged the power of the press by convincing his followers that any news critical of his actions is “fake news.” He has convinced his followers that the FBI, the DOJ and most other government agencies are controlled by the “deep state” which is determined to undermine his decisions. He dismisses the findings of our intelligence agencies and takes the word of our nation’s greatest enemies, instead. He and the GOP-controlled Senate have filled our court system with ideologues with neither the experience, the objectivity nor the temperament to act as judges. In addition, he has undermined our relationships with our most loyal allies. And, according to many of those who have known him longest, if impeached or defeated in the 2020 election, Trump will not relinquish his office quietly. Indeed, they fear a second civil war. If those people are correct, Trump and his followers will no doubt claim that they are declaring martial law out of a sense of patriotism. What Would A Russian Operative Do If He Ran For President Of The United States? He would appoint a pro-Russian lobbyist as his campaign manager. He would change the platform of his political party to make it more friendly toward Russia. He would invite the Russian ambassador to his party’s national convention. He would request and accept Russian help with his election campaign. He would have his campaign manager provide polling data to his Russian handlers so that Russia could more accurately target US voters with its disinformation campaign. He would have members of his campaign staff and transition committee try to open secret back channels with Russian president Vladimir Putin. He would accept millions in donations from pro-Russian Ukrainians for his inauguration. He would appoint a retired general who was acting as a foreign agent as Director of National Security. He would appoint unqualified sycophants to key positions in his administration with the express purpose of dismantling the agencies they control. He would refuse to fully staff most government departments, especially those in leadership positions. He would refuse to fully staff the State Department. He would refuse to appoint ambassadors to many US allies. He would try to undermine American’s trust in all government institutions. He would encourage and sign a bill to cut taxes that would result in unprecedented national debt. He would fire the leadership of the FBI and diminish its standing among millions of his supporters. He would dismiss the findings of all five US intelligence agencies and accept the word of Vladimir Putin, instead. He would try to block and derail any investigations into his connections with Russia. He would constantly attack the opposing party with the intent of dividing our nation as never before. He would promote and pursue racist policies to further divide our nation. He would lie so often that citizens would have difficulty telling falsehoods from the truth. He would call the media “enemies of the people” and blame our problems on them. He would undermine the relationships and standing with America’s closest and most loyal allies. He would attempt to delay and block economic sanctions on Russia that were passed by Congress. He would welcome Russian diplomats into the Oval Office and provide them classified information obtained by a US ally. He would allow only Russian media to attend the meeting. He would create chaos with the nation’s trading partners by imposing unwarranted tariffs that would cause damage to many of our key industries. He would have secret meetings with his handlers and destroy any record of them. He would suddenly, with no military reason, announce the withdrawal of US troops from Syria relinquishing control of the region to a dictator and Russia. He would attempt to rewrite history by promoting Vladimir Putin’s version of the Soviet invasion of Afghanistan. He would shutdown the US government on a whim and refuse to negotiate in good faith to reopen it. As you can see, it doesn’t matter if Donald J. Trump was actually recruited to be a Russian spy. He is acting as one. 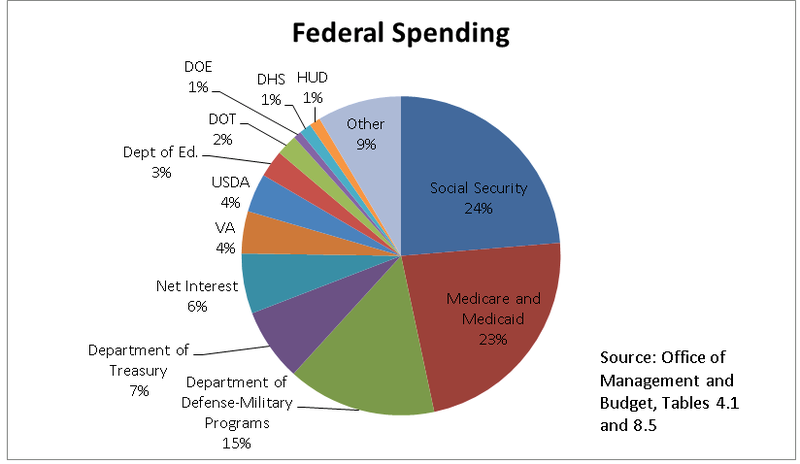 Notice that the two largest slices of the budget represent Social Security, Medicare and Medicaid, or what is often called “mandatory” federal spending. Thus, the chart would seem to indicate that most of the tax revenue goes toward healthcare and retirement for the elderly and the poor. Is it any wonder, then, that so many young people believe that the federal government is being “bankrupted” by payments to senior citizens? 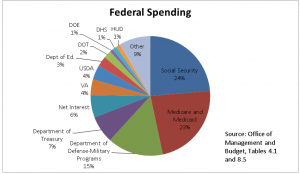 However, most of the costs for Medicare and Social Security are not part of the general budget. Medicare and Social Security are, in fact, insurance programs similar to your auto, health and household insurance policies. And, like your other insurance policies, the premiums for Medicare and Social Security are collected each year of your working career so the benefits will be there when you need them. The premiums are deducted from our paychecks – you know, the ones that are labeled FICA (Federal Insurance Contributions Act) and Medicare. As a result, Medicare and Social Security are “entitlements” only in the sense that once you have paid the premiums, you are entitled to the benefits in much the same way you’re entitled to benefit from claims against your Allstate, GEICO, Progressive or State Farm policies. 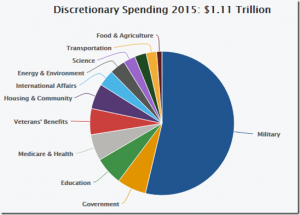 This chart represents the spending controlled by Congress and paid for through taxation. As you can see, in this chart, the majority of that spending is for our military ($824.6 billion, up more than 13 percent since Republicans have taken the reins of government) and veteran’s benefits ($78.9 billion). When Congress spends more on these items than it collects in taxes, it results in deficit-spending. The shortfalls result in borrowing from other sources – from other countries and from the Medicare and Social Security trust funds. Despite their claims to the contrary, Republicans have been particularly good at deficit spending. Reagan nearly doubled the federal debt, increasing it by $1.9 trillion. George W. Bush increased the debt by $5.8 trillion. He also left his successor with two wars and the Great Recession resulting in more than $8.5 trillion of additional borrowing. And, in his first two years in office, Donald J. Trump has already doubled the deficit, increasing the debt by more than $1.2 trillion. And the 10-year cost of the Trump tax cuts will add an estimated $2.3 trillion more to the federal debt. In order to reduce the debt, Senate Majority Leader Mitch McConnell says he wants to balance the federal budget by cutting payments to “entitlements,” aka Social Security, Medicaid and Medicare. That would be akin to embezzling money from your employer to pay for your own spending excesses. The Social Security and Medicare trust funds are not Congress’s money! None of this is to say that Medicare and Social Security don’t have their own problems. If changes are not made, it’s expected that Medicare will exhaust its reserves by 2028. Likewise, it’s expected that Social Security will not be able to meet its full obligations after 2034. But that does not mean that there will be no money left for the programs’ beneficiaries. It simply means that the payouts will be less. And both programs could meet their obligations with a few tweaks. Like all insurance programs, they should be governed by actuarial tables. When the costs go up, so should the premiums. Unfortunately, Congress has put limits on the amount of money the programs can charge for premiums. For example, FICA deductions only apply to the first $128,400 of an individual’s income. Social Security could be fixed by simply removing the cap. It’s that simple. Similarly, Medicare’s impending problems could be solved by increasing the payroll deductions, by negotiating for better prices with pharmaceutical companies, or, better yet, we could improve outcomes while saving our government and our citizens trillions of dollars by moving toward universal health care. And, here’s a radical idea: Maybe we could find additional money for these programs in the general budget by holding government contractors accountable. For example, the F-35 fighter jet program was $163 billion over budget as of 2014. A figure that continues to climb faster than the plane. The “Enemies Of The People” Versus The Enemies Of Democracy. These so-called enemies are the people who risk their lives in war zones so that we might know the truth. They are the people who dig through stacks of financial documents in order to ferret out the cheaters and criminals. They are the people who sit through hours of mind-numbing meetings to report the actions of local governments to their citizens. They are the people who endure constant abuse to report on the actions of this corrupt and abusive administration. The only media that seem exempt from Trump’s wrath are Fox News (Shepard Smith and Chris Wallace excepted), Breitbart, the Daily Caller, InfoWars and both Sputnik News and Russian TV. All of which report Trump’s legion of lies without question. For the most part, the so-called patriots who identify themselves as Republicans have gone along with Trump’s attacks in order to accomplish their Koch brothers funded goals of reshaping the judiciary, further cutting taxes for the wealthy and corporations, eliminating environmental and financial regulations, rewriting the Constitution, privatizing schools, and privatizing or eliminating Social Security, Medicare, Medicaid and the VA. If institutions such as news organizations stand in the way, so be it. Apparently, in the minds of Republicans, the sacrifice will be worth it. In a recent poll, fully 43 percent of Republicans would give Trump the power to shut down media that he dislikes. Never mind that such action would be unconstitutional. Never mind that it would eliminate one of the very few institutions in a position to hold a corrupt administration accountable. To far too many Republicans, it seems the ends justify the means. Even if those ends are achieved by destroying our government and, indeed, our democracy. Thankfully, the vast majority of our news organizations and reporters are exercising their First Amendment rights. In defiance of Trump and his GOP enablers, more than three hundred newspapers across the nation have joined forces on this day to publish editorials in support of a free press and against anyone who would seek to diminish their responsibility to report the truth no matter how ugly. And, given the actions of this administration, in the history of our nation, it has never been uglier. So, today, in honor of real journalism, take some time to read the newspaper editorials and to explore reports from news media you don’t often read, watch or hear. Open your minds to the truth whatever it may be. It certainly isn’t coming from the White House.